Dianthus also known as Pinks are flowering plants that belong to a family of plants which includes Carnations and are characterized by the spicy fragrance the blooms emit. They may be found as a hardy annual, biennial or perennial and most often used in borders or potted displays. The Dianthus plant is also called Sweet William (D. barbatus) and has a fragrance with Cinnamon or Clove notes. The plants are small and usually between 6 and 18 inches (15 to 45 cm) tall. 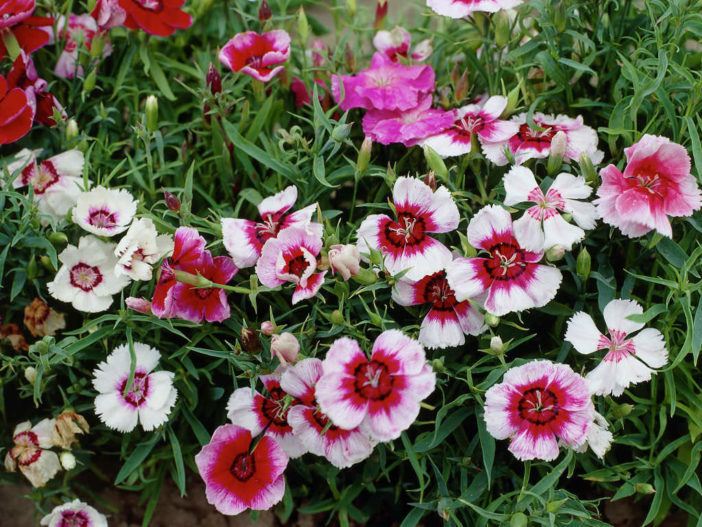 Dianthus flowers are most often in pink, salmon, red and white hues. The foliage is slender and sparsely spread on thick stems. Plant Pinks in full sun, partial shade or anywhere they will receive at least 6 hours of sun. The plants need fertile, well-drained soil that is alkaline. Wait until the danger of frost has passed when planting Dianthus and place them at the same level they were growing in the pots, with 12 to 18 inches (30 to 45) between the plants. Do not mulch around them. Water them only at the base of the plant to keep the foliage dry and prevent mildew spotting. Some varieties of Dianthus are self-sowing, so deadheading is extremely important to reduce volunteer plants and to encourage additional blooming. Perennial varieties are short lived and should be propagated by division, tip cuttings or even layering. Dianthus seed is also readily available at garden centers and may be started indoors six to eight weeks before the danger of frost has passed.